Since many years corporates are used to offering PDF download options for documents like marketing flyers, white papers, articles, case studies, annual reports, quarterly report etc. With more and more user on mobile devices, it is important for companies to offer options of mobile-friendly file formats like ePUB and Mobi. 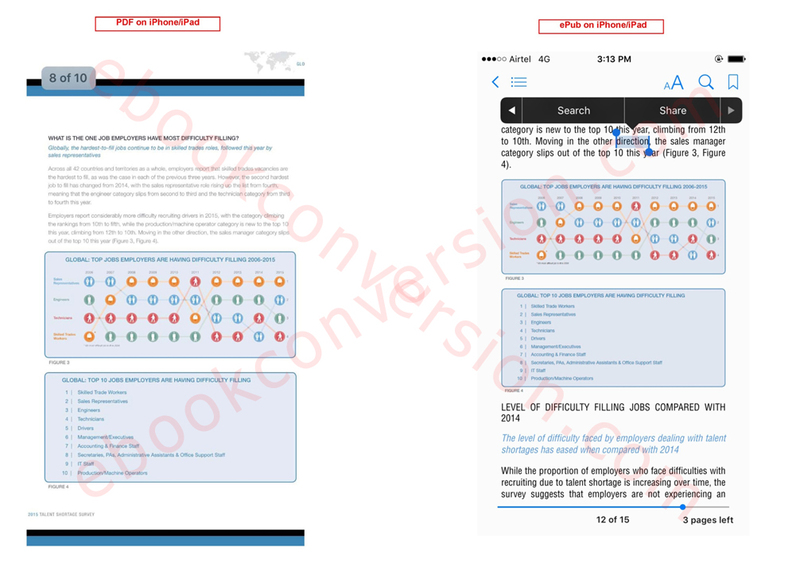 Following are some of the comparison points to help you understand why eBook formats should be offered by corporates. 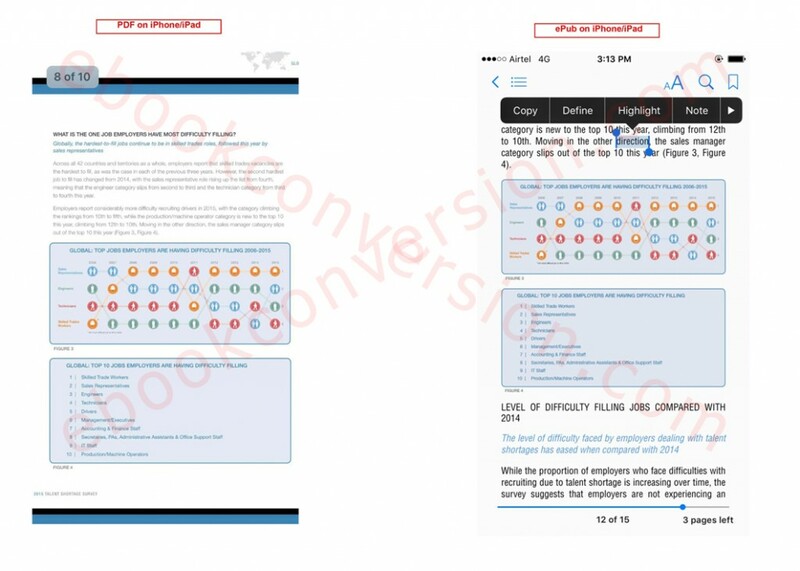 We have taken screenshots of PDF on iPhone/iPad and ePUB file on iBooks on iPad/iPhone. Fonts in ePUB can be resized, making it easier to read on smaller screens. 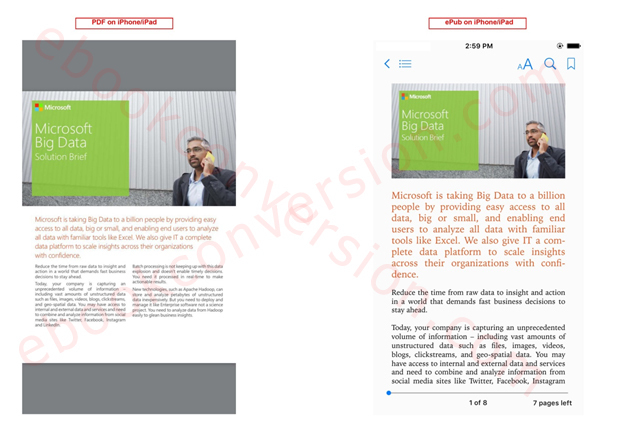 The reader can also change font styles which are not possible in PDF file. In the example below you can notice that it is easy to read though content when the file is in ePUB. 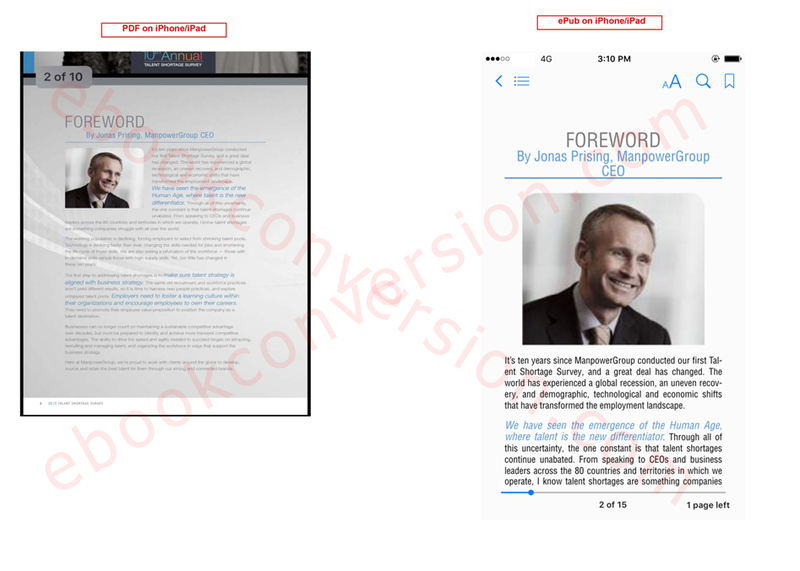 In eBook formats, column can be set in reflowing text. With the increase decrease font feature in ePUB file, text can be seen clearly. 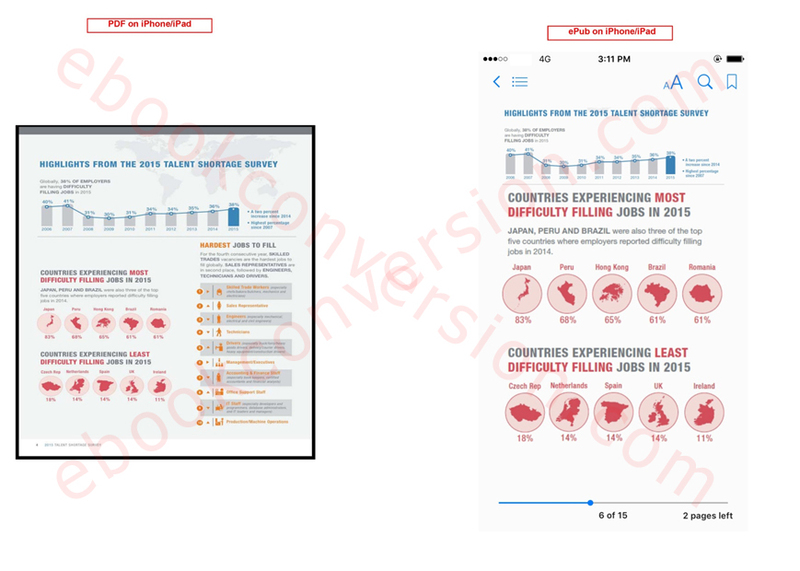 To view the text in PDF, you have to zoom the file and then scroll left and right to view a line. Text can also become blurry if it is zoomed at higher levels. 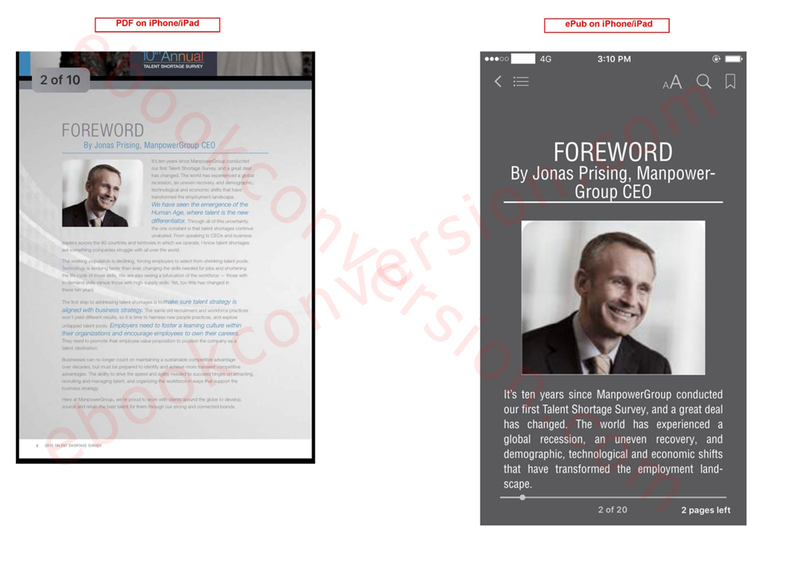 Activate image for zoomed view in the ePUB file. 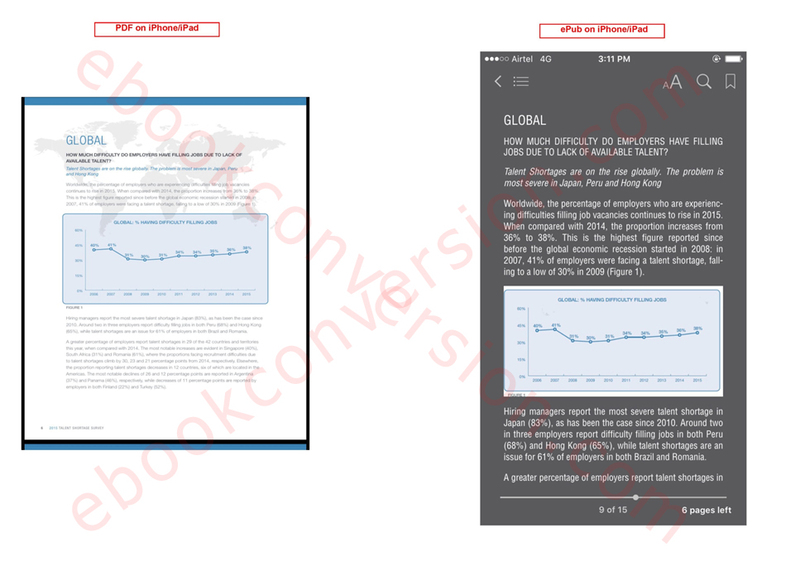 In ePUB you can activate images to for bigger view while in PDF you have to zoom the whole page to zoom in on the image. 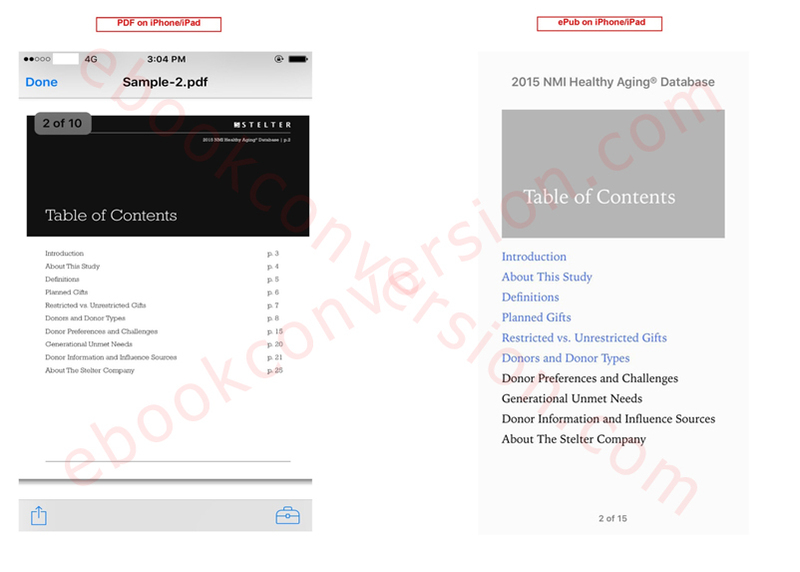 In the sample below you can see the table image activated in the ePUB file. 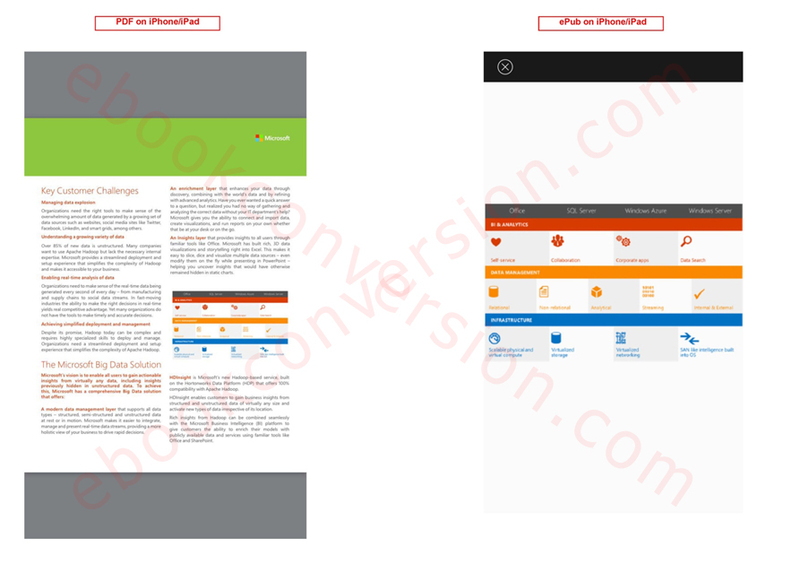 EBook allows the reader to change some of the style, layout etc. Many eBook devices allow readers to change the font style, font size, page size, margin size, colors, and more. 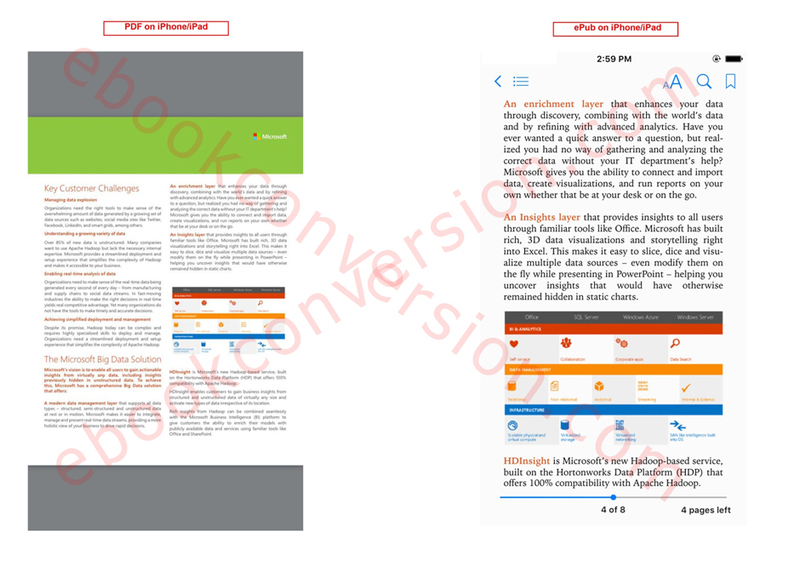 The reader can change background of eBook and light mode as per reading environment. EPUB allows embedding high-resolution image which on activation will show the clear and sharp image. Interactive table of contents is the best part of eBooks. 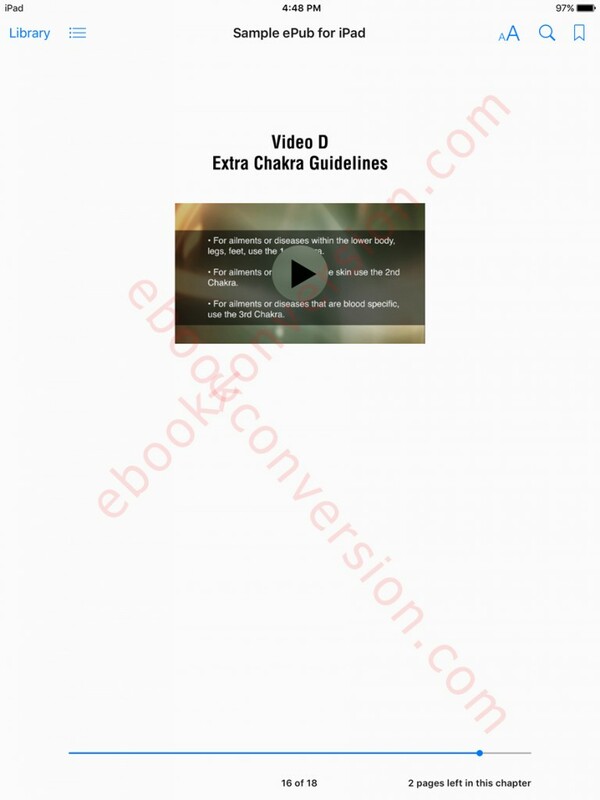 The reader can click on a chapter and directly go to that chapter page without scrolling pages. The reader can view the book in the night without having a big glare on the face. This mode is easy on the eyes and does not disturb others with bright light. It is very easy to search text in the ePUB file. ePUB search feature will show all pages where the text is available. In the following the example the word Global is shown where it is in the text and its location in the book. The reader can copy text, define, Highlight text, make note/comment and many other things which make the book format very user-friendly. You can select text and search online and share it instantly. We can add video in ePub and make in interactive. Ebooks are evolving. As technology develops, ebooks may contain new features. 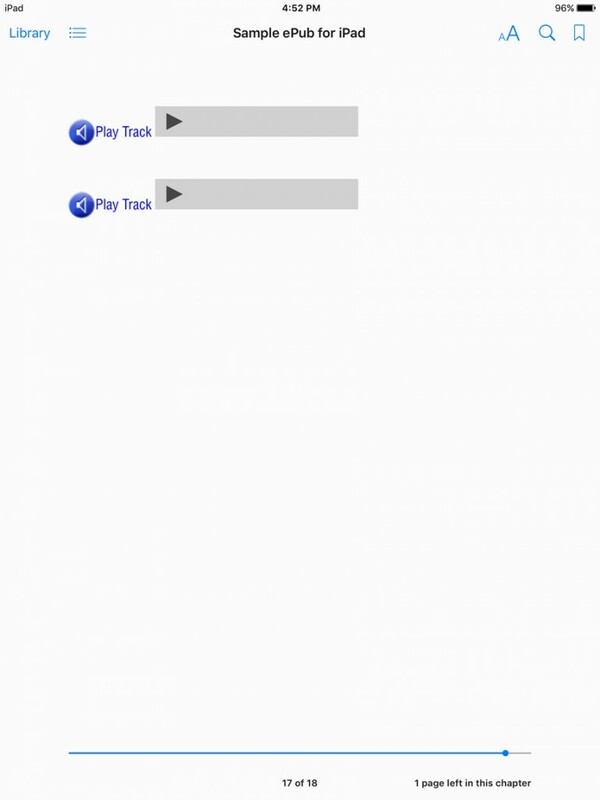 We can add audio in ePub and make in iterative. Ebooks are evolving. As technology develops, ebooks may contain additional new features. This is the example of an active footnote. We have shown some of the examples of what we can do with the ePUB file. 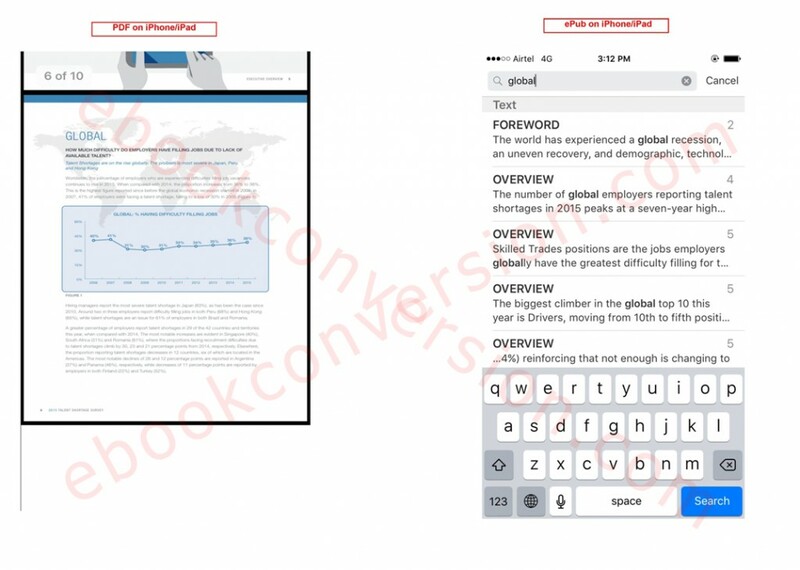 Feel free to contact us to discuss your project requirement on how to make a functional and user-friendly eBook for your whitepaper, flyer, quarterly reports, annual reports etc Contact us at Bob@ebookconversion.com or call 515-865-4591.